In 2014, North Carolina lawmakers, prodded by the natural gas industry and with no notice to the public, rushed through a bill lifting the state’s moratorium on fracking. Shortly after, the state’s industry-dominated Mining and Energy Commission finished a set of fracking rules, and the state was ready to issue its first-ever permits for natural gas infrastructure in North Carolina. Experts have identified gas shale formations, though limited, in central North Carolina, and the geology in other parts of the state indicates further potential deposits, including in Stokes, Rockingham, Jackson, Haywood, Macon, Swain, Cherokee, Clay and Graham counties. As of summer 2016, no applications had been submitted. Yet, citizens remain unnerved by the prospect of a dangerous fracking operation suddenly appearing in their community. Appalachian Voices has been connecting with these citizens to help keep watch on state and industry activities, and to continue to raise broad public awareness about the many downsides that fracking would have in North Carolina. 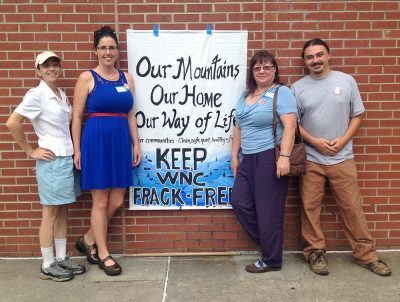 Numerous community groups — such as those in the Frack Free NC coalition — have organized around the issue. Under the state’s loose regulatory framework, fracking would pollute the air, drinking water sources and streams. 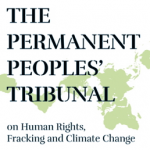 In fact, the 2014 law lifting the moratorium also makes it a crime for anyone to reveal the chemicals used in the drilling technique. Fracking could also potentially trigger earthquakes, as well as depreciate property values, and the truck traffic could pose a safety risk to nearby neighborhoods. Moreover, allowing the gas industry to tap new deposits in North Carolina would increase methane emissions — a highly potent greenhouse gas that would worsen the impacts of climate change — and squelch investments in truly clean energy options such as efficiency, wind and solar. Appalachian Voices is working with citizens and organizations to build a strong statewide movement to ensure these concerns are heard. 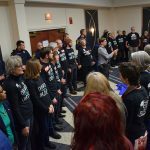 In 2014, we helped turn out almost 2,000 people for public hearing on the issue, and joined more than two dozen environmental and social justice groups to hand deliver a petition with close to 60,000 citizen signatures calling on Gov. McCrory to reinstate the fracking ban in North Carolina. After the state lifted the moratorium, the Eastern Band of the Cherokee Indians said it would forbid fracking on its sovereign land in what is now western North Carolina. The governing bodies of Chatham and Stokes counties also passed moratoriums on fracking within their borders following public outcry. 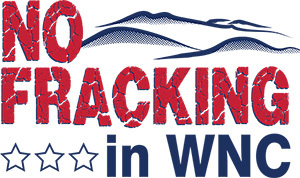 In response, the state legislature in 2015 adopted language saying that “local ordinances that ‘regulate or have the effect of regulating’ oil and gas exploration are invalidated and unenforceable.” But the counties are not backing down; several additional counties and municipalities have passed moratoriums or ordinances against fracking and have not been challenged. Appalachian Voices and our partner organizations will continue pressuring the legislature to reinstate the moratorium on fracking. Our priority is to amplify the voices of concerned citizens, stop further investment in outdated, dirty fossil fuels, and vigorously advocate for clean energy as a safer, more just and more sustainable way forward. Further, we are joining with other groups in North Carolina to oppose the proposed fracked-gas Atlantic Coast Pipeline, which would cut through eight counties in the eastern part of the state, and stand in opposition to more gas plants coming online. Allowing the gas industry to tap new deposits in N.C. would squelch investments in truly clean energy options.